Thu, Mar 21, 2019, 12:49 am SL Time, ColomboPage News Desk, Sri Lanka. 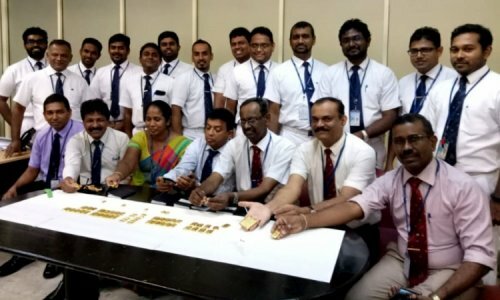 Mar 20, Colombo: Sri Lanka Customs officials at the Bandaranaike International Airport in Katunayake have arrested six Indian nationals and three Sri Lankans while attempting to smuggle gold worth pieces nearly Rs. 40 million into the country. Acting Customs spokesman and Deputy Director Vipula Minuwanpitiya said the suspects arrived from Chennai Wednesday morning were arrested at the airport arrival lounge with 59 yellow gold pieces weighing nearly 5.25 kilograms. The gold pieces were concealed underneath their trolleys and hidden inside their undergarments. The gold stock is estimated to worth Rs. 39,247,810. The three Lankan passengers were residents of Vavuniya and Kadugannawa and the Indian antionals were from Tamil Nadu. Customs are conducting further investigations.